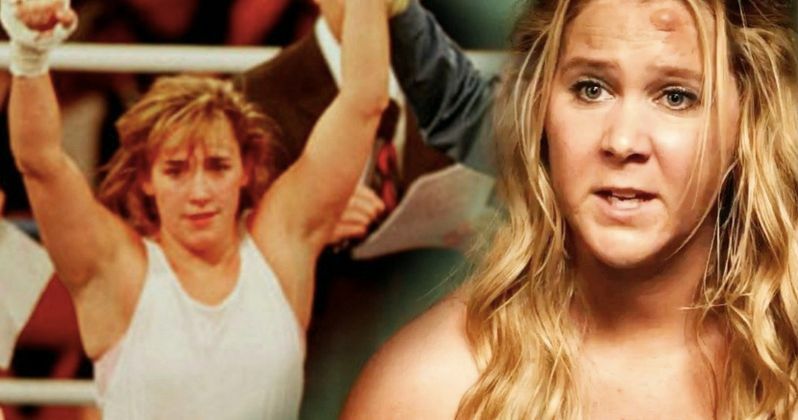 Amy Schumer, best known for her stand up comedy routines and her comedic films, is taking a dramatic turn, coming aboard a new biopic based on the life of female boxing champion Christy Martin. Schumer will star as Martin, who helped legitimize the sport of female boxing in the 1990s, even appearing on the cover of Sports Illustrated at one time. This biopic is described as a gritty drama, which will be quite a different turn for Schumer, that will showcase Martin's triumphs in the ring, and her troubles outside the ring that nearly left her dead. Christy Martin was born Christy Salters in Mullins, West Virginia, and she attended Concord College in Athens, West Virginia on a basketball scholarship, where she earned a degree in education. She first started fighting in "Toughwoman" competitions where she won three titles, before transitioning to boxing in 1989, at the age of 21. After starting her boxing career with two wins, a loss and a draw, she won a whopping 19 straight fights, including her first title fight in 1993, where she defeated Beverly Szymansky for the WBC women's Jr. Welterweight world championship. After a draw to Laura Serrano in 1994, she won another 15 fights in a row, including a 1996 fight with Deirdre Gogarty where she was recognized as the WBC's first women's lightweight champion of the world. The Gogarty fight increased her profile and helped turn her into a celebrity, leading to the Sports Illustrated cover, and she also became the first ever female boxer to sign with notorious boxing promoter Don King. Martin lost her title in a 10-round decision to Sumya Anani in 1998. While she would ultimately win her next nine fights in a row, she lost to IBA Super Middleweight champion Laila Ali in 2003, which would ultimately signal the beginning of the end of her career. Her last nine fights, from 2005 to 2012, resulted in four wins, four losses and one draw, including a loss to up and coming boxer Holly Holm in 2005, who would go on to shock the world 10 years later by defeating Ronda Rousey for the UFC Women's Bantamweight Championship in 2015. Her toughest fight would be outside the ring, though, with her husband that left her for dead. Martin had married her trainer James Martin in 1991, but in 2010, Martin informed him that she was leaving him for a woman, her lover and business manager Sherry Lusk. A week later, on November 23, 2010, James stabbed Christy Martin several times and shot her at least once, leaving her for dead in the home they shared in Apopka, Florida. Martin managed to survive the attack, leaving her home and flagging down a car to take her to the hospital. James Martin was found guilty of second-degree attempted murder in 2012, and sentenced to 25 years in prison. Martin retired with a professional boxing record of 49 wins, seven losses and three draws and in 2016, she became the first female to ever be inducted into the Nevada Boxing Hall of Fame. Katherine Fugate (Army Wives, Valentine's Day) is directing from a script she's writing, with Voltage Pictures setting up the project. Alix Madigan, Nicolas Chartier and Alissa Phillips will produce, with Jonathan Decker serving as an executive producer. Amy Schumer will next be seen in STX Entertainment's I Feel Pretty, which Voltage Pictures is also producing. She is also attached to writer-director Rebecca Miller's She Came To Me, alongside Steve Carell and Nicole Kidman. Deadline broke the news on this Christy Martin biopic earlier today.